St Leonards is a coastal township on the end of the Bellarine Peninsula facing eastwards onto Port Phillip Bay. It is 46 km south-west across the bay from central Melbourne and 30 km east of Geelong. James Langdon took up his St Leonards pastoral station in the area in 1849, possibly taking the name from the town of that name in Sussex, England. Langdon was a partner of George Cole, a Melbourne merchant and owner of Coles Wharf on the Yarra River. Cole later operated paddle steamers in Port Phillip Bay. Shortly after Langdon's purchase Cole acquired land along the foreshore, both sides of the present-day St Leonards. He is thought to have established a firewood trade from the Bellarine Peninsula to Melbourne and to have built the first houses at St Leonards. A pier was functioning by 1862. Other early industries were brickmaking and grazing. The jetty was used for the carriage of agricultural produce as well as for poultry, pigs and fish. 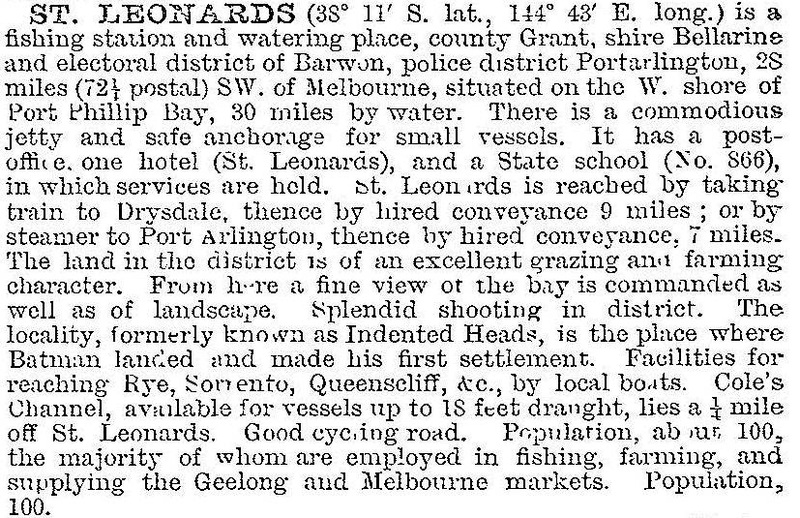 Along with several coastal towns on the Bellarine Peninsula, St Leonards became a camping and fishing resort. St Leonards has grown steadily since the 1960s. It has a foreshore reserve from Indented Head (to its north) to Lower Bluff wildlife reserve, interspersed with three camping areas. There is a large nature reserve adjoining Salt Lagoon, St Leonards Lake and an adjoining reserve in the township, an arboretum and another reserve along the main road to the jetty. The large Edwards Point wildlife reserve is at the south of St Leonards and extends into Swan Bay. The shops, the Catholic church, the State primary school (1910) and the bowling club are also along the main road. The golf course is near Salt Lagoon and the Anglican church (1915) is in Dudley Parade. There are foreshore camping areas and a caravan park. St Leonards primary school had 89 pupils in 2014. The median age of residents at the 2011 census was 54 years (Australia, 37 years). On census night in 2011, 41% of dwellings were occupied. St Leonards is a place for both retirees and holiday houses.